How do I copy playlists from my iPod to iTunes? If you have created a playlist on your iPod and wish to copy it to your iTunes library, you may be a bit surprised that iTunes does not provide a simple way of importing playlists from your device to your library. Our TouchCopy software can help you with this, by copying your playlists in a couple of mouse clicks. Launch TouchCopy by click the TouchCopy 16 icon on your desktop. Connect your iPod to your computer via the USB cable. Select the playlist you wish to copy from your iPod and click "Copy to iTunes" in TouchCopy. If your playlist contains 100 songs or fewer, you'll be able to copy it using the free TouchCopy demo. 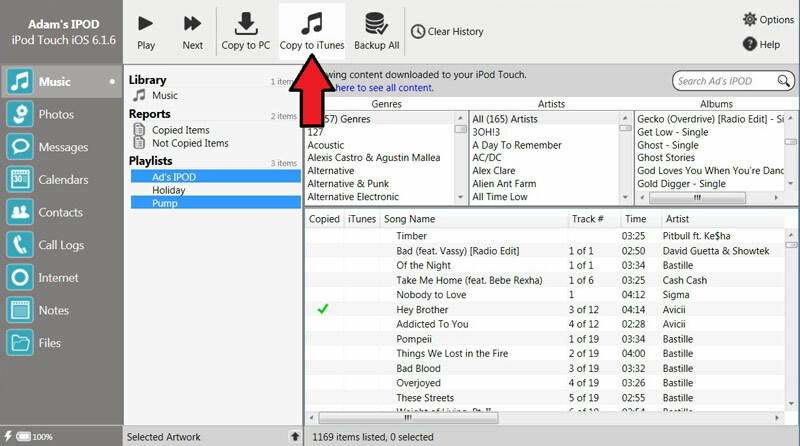 A full version of TouchCopy is required to transfer more than 100 iPod songs to your computer or iTunes. To transfer your iPod playlists into iTunes select the Playlists you want from the source list in TouchCopy. You can select multiple playlists by CTRL-Clicking items in this list. Once you have selected your Playlists - click the iTunes button in TouchCopy. When transferring a playlist into iTunes, the songs are transferred and a new playlist of the same name is created. Note that if a track is already in your iTunes main Library, TouchCopy will not create a duplicate of that track in iTunes, it will just add the track to the Playlist. For details on copying playlists to iTunes please see the TouchCopy user guide. TouchCopy can also copy your playlists to your computer hard drive. For this, select a playlist and click on "Copy to PC" or the "Copy to Mac" button. Music in the playlists will be saved to your computer in the folders and file name format you have specified in TouchCopy Options. TouchCopy also produces an XML file named after the Playlist you are copying. This XML file contains information about the tracks and track order of the Playlist. The XML file can be used to import the playlist into iTunes by choosing File > Library > Import Playlist in iTunes. Also please see our YouTube video demoing how to transfer songs and playlists to iTunes. How to recover Smart and Genius playlists from iPod and iPhone? Can TouchCopy transfer DRM protected music to my computer?